I spent the good part of 2008 trying to overcome a lifetime aversion to the color pink. It's a long sordid story, but I've had issues with that color my entire life. At forty-plus years of age I decided last year to make peace with my demons and although I may not embrace pink, I should learn to accept it. It was a year of small, quiet triumphs, and deep soul-searching that culminated in a weekend of pure, pink, shock-therapy. 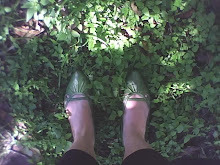 I walked away feeling less hostile about the color, but not joyfully embracing it. Until this weekend. My current purse died an untimely death. The autopsy will probably show too many items shoved into it's generous pockets, or perhaps an over-reliance on the rugged, yet elegant straps. It was the perfect blend of glam and bling, and I didn't want to let it go but I had to come to terms with needing a new purse and soon. After a week of being house-bound I decided to venture out looking for a purse and on a secondary note a bag for my classes. My class bag has also been showing wear and tear, but I haven't allowed it to die for years. I decided that both bags must go and this was the weekend to lay them to rest. Here's one last photo; their flaws may not be evident on the surface, but I promise structurally they were headed for disaster. After a fairly short shopping trip I found two bags, in two separate stores. I know, it looks like they were separated at birth...and they may have been. 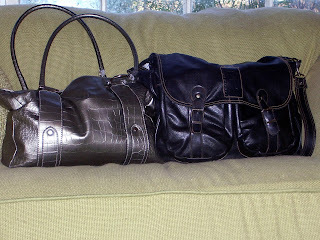 The purse (on the left) is actually larger than my last one, much deeper...but also more narrow. (You can't see her slim figure in this photo). For my class bag, I opted for a more subtle, simple option. 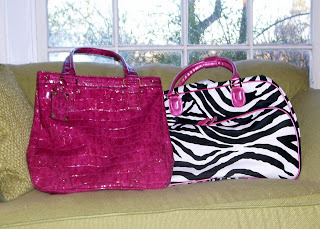 The two ladies are making themselves at home this evening, and it seems perfectly natural that I now own a honking-huge electric pink purse. This is girlihood in all it's glory.